File Types : PNG, JPG, All Files; File Size: 7.11 MB; DPI: 300 DPI; Vector: Yes. This is a set of 50 vector and PNG format hand drawn fairy tale clipart. Perfect for making your own baby shower or party invitations, kids room art, posters, products, scrapbooking, photo overlays, logos, party decorations, or anything you can come up with! It's easy to change the color in any vector software and also comes with transparent PNG files. Includes horse and carriage, butterflies, storybook, princess dresses and ball gowns, crowns, wand, frog prince, castle, rose, typography, hand mirror, sparkles, and more. For personal or commercial use under SimpleLicense. 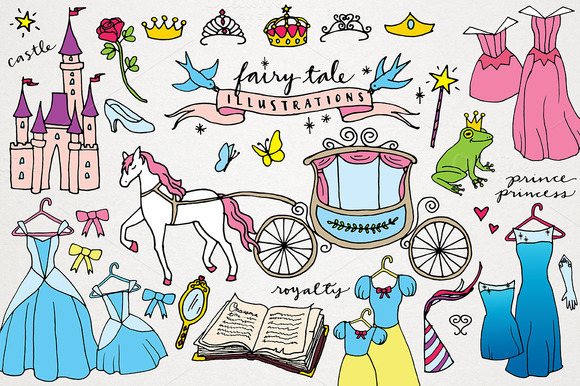 Keywords: fairy tale clipart, fairy tale, clipart, clip art, vector, princess, hand drawn clipart, magical castle, horse and carriage, baby shower, kids clipart, baby girl, printable, fantasy, dresses, butterflies, pastel colors, royal, princess clipart, rose.